Before we get started today, I have a cool new feature on the ol’ blog that I want to tell you about! My friend Andrea (the creative genius behind Simply Askew Designs and the designer of this blog) installed some type of code on my blog that allows you to pin items you like directly to Pinterest. Just hover over a picture with your mouse, the Pinterest “P” will appear, and click it! I hope you guys use this option and pin away! Also, I have a GREAT story to tell you ladies about the Callisto wedges (HERE) and the Sequin bracelets (HERE). I will tell it on Friday! If you haven’t figured it out yet, there’s something you need to know about me. When I like something or feel like I got a good deal on something, I feel a deep need to let the whole world know about it. This might help explain why even when a stranger tells me that they like my shirt, I will almost instinctively yell out where I bought it and how much I spent on it. A nice “thank you” would do. But that’s just not how I roll. I have such fun sharing great things with them, and I often won’t shut up about them until I have them all agreeing with me. Let’s take the sandwich of the summer of 2011. I created the perfect summer sandwich. I really did. I brought it to the pool every day and talked about it incessantly. By mid summer, everybody else was totally and completely hooked on the sandwich too. Shay is actually doing a lunch series on her blog that she just started last week, and this sandwich will be featured soon! I’ll of course link to it when it is up! So anyway, I think it’s been well established that if I REALLY like something, I’m going to talk about way more than 1 or 7 times. I am however talking about THIS oatmeal blazer again. But only because I wore it again…and I thought the outfit was definitely blog worthy. Here is the outfit I recreated. *REMEMBER TO ORDER 1 SIZE UP IN THE BLAZER BECAUSE IT IS A SLIM CUT! HERE is a good option for you if you are looking for something dressier. It is a bit darker in color, but still a slim cut! THIS one is collarless (which is a cool detail), it’s on sale, and it has great reviews! This one comes in petite HERE. THIS one is on sale too. 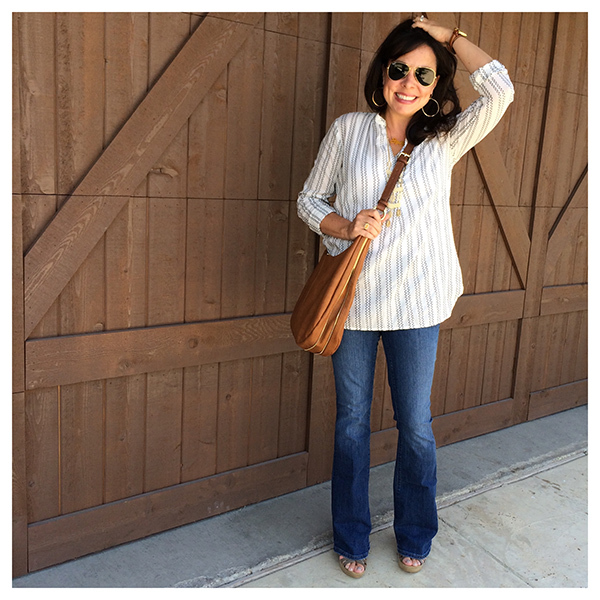 I love my distressed jeans! Make sure you get the length you need to. 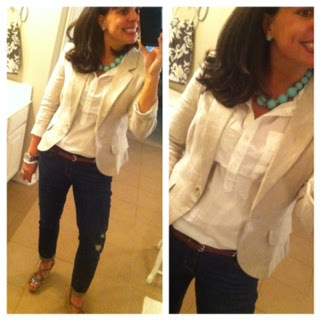 You guys know how much I love my J Crew Factory mint green necklace. It’s been sold out forever, but I do love THIS option. The only thing similar to my necklace is the color, but I think it’s great and could be so versatile…especially in the summer months. I have been astounded at how the mint green is so often the perfect accent color to an outfit (especially white, pink, and coral). So, here I am in the 1st 3 looks I’ve created with THIS blazer. My next blazer look is going to be with dark jeans and a dark shirt. So, I’m dying to know? Are you guys loving the blazer as much as I am? Oooohhhh…while browsing the internet on Mother’s Day, I found a purse at Modcloth that is crazy similar to a designer bag from Nordstrom. One is from Modcloth for $54.99 and one is a Rebecca Minkoff for $350. Pretty similar, huh? I saw the designer bag in person on a friend and it is GORGEOUS. I haven’t ever paid that type of money for a bag like that, but I could totally spend $55! Which one do you think is which? Click HERE for the splurge, click HERE for the steal. 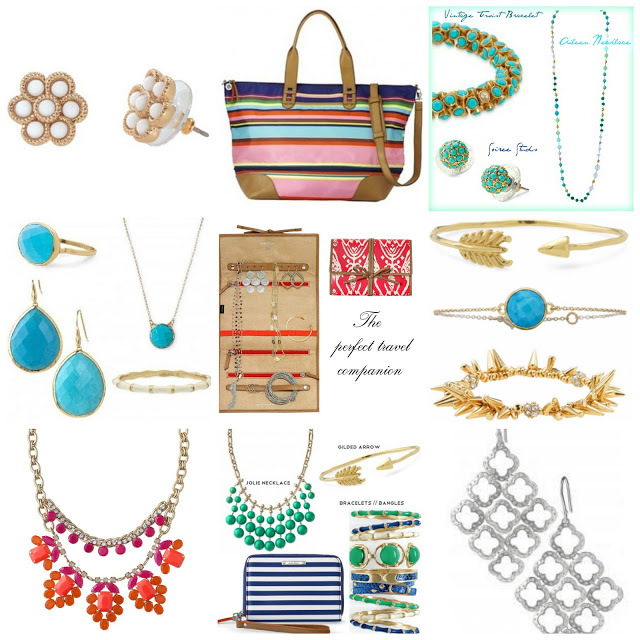 Before you go, Stella and Dot is having a 1 day sale today! Did you catch that? IT’S TODAY ONLY! So, if you’ve been pining after 1 or 2 things, now is the time to act! The savings will be automatically applied at checkout. NO CODE NEEDED. I know that several of you have been wishing for The Kimberly Necklace (click HERE). This would be a great time to get it! Also, if you need something to get you to the $100, THESE are a fantastic pair of everyday earrings (which would also be great for end of the year teacher gifts). Did you never jump on the bandwagon for the sparkly green earrings? Do it now! Click HERE! Or….what about their new line of bags? Click HERE for all of the new travel bags! If you are going anywhere this summer, you could get a great carry-on and an awesome jewelry organizer (click HERE). I have the jewelry roll and it is awesome. The poufs have been so popular (click HERE) and keep selling out, but they are in stock now, so get while the gettin’ is good! See anything you like? Click HERE to place an order! It all started with one little e-mail…. I Hadn’t Planned on Posting Today, BUT THEN…. This is a good one. And I feel like the creator of the blazer should probably send me some money. Or at least a blazer. What 3 Things I’m Obsessed With Now! I do love the blazer! I really do! I especially love it with the boyfriend jeans. That's totally me! Ha! I had that experience yesterday. A woman came up to me at lunch and said "I love your dress". Instead of just saying thanks, I had to launch into where I got it, how much it was and that it was on sale. My hubby said, why didn't you just tell you have a blog and give her your card while you're at it? I told him that's just weird. LOL! That's an awesome blazer, I've been eyeing one in white. Love it!! You look fantastic! I need to go ahead and order a blazer to have for fall… I'm afraid I've missed my window to wear it before the SC heat smothers me! 🙁 but! I ordered my wedges! The wedges sent from heaven! Can't wait to try them on! Hi kteacher! Can you e-mail me directly? Your comments are set to "no reply" so I cannot respond directly to your e-mail. Email me at pinteresttoldmeto@yahoo.com and I will get some links to you! I think it's great that you enjoy compliments and don't mind telling others where your items came from. Super Sweet!!! 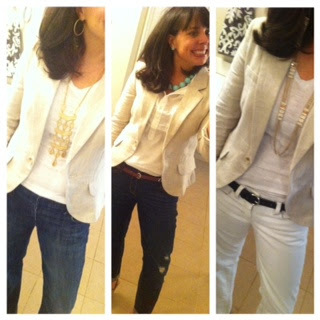 I too love the neutral blazer! I tried one on very similar at T.J. Maxx this weekend–now I wish I would have purchased it. 🙁 It would also look great with a pair of fitted shorts-maybe black or white and of course those wedges!!! 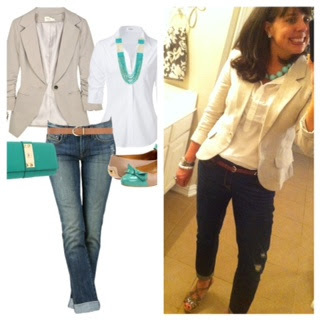 I'm wondering if you wear the blazer at work and out and about…it's so hot in the summer, that i'm good in a tank top, but I know that's not professional. So what about on hot summer days? Blazer or no? I love the blazer!! It get's really hot in the summer. I love how blazers (or even my military jackets) makes a basic tank and shorts look so much more put together… but when it's really hot out what to do??? Is this jacket cool enough to wear outside during summer days? Would love some other ideas on what might work! I keep seeing vests but think they might be too young looking! I would have replied directly to you, but your blogger settings are set to "no reply". I hope you check back here for my answer. 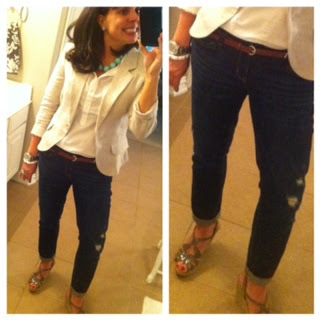 I agree, a blazer totally pulls an outfit together and makes it look SO polished! All summer long I wear blazers or cardigans if I'm going anywhere with air conditioning (an office building, a mall, a restaurant, etc…). But I'm cold-natured, so maybe that's just me?!? I tried a vest on last week, and I couldn't get used to it. Thanks so much!!! Need to change my settings! That def helps!!! Your outfit!!! LOVE it!! I have all the pieces (or similar pieces) so I am totally going to copy you! Can't WAIT to try your sandwich. Seriously. I LOVE sandwiches! P.S. I also OVERSHARE if someone compliments my outfit, etc. Totally tell them where I got it & for how much. Hahaha! Another reason we are friends….both talkers!!!! I ate that sandwich, summer 2011! And I still recreate it today. And any time I've made it for others they swoon. So yes it makes the world a better place when 1 or 77 times you mention what you like. For instance, I'm goin to splurge for myself and buy that incredible oatmeal blazer thank-you-very-much because I know when you rave about something it's legit. And girls. Another comment. In the summer it IS sweltering hot and so a tank with shorts and wedges is perfect. But when you go in to the air conditioned restaurant or movie theater or grocery store (or the gap!) it's flipping arctic so buy a blazer to throw on and you'll be perfect!!! I just got a khaki jacket that I LOVE! 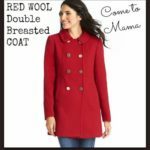 It's been cool in Nashville this Spring so we have needed jackets and cardigans! Thanks for the advice!!! Also, don't forget to clip your Sassy and Southern pendant on that cute turquoise beaded necklace that you have on!!! It would be so cute! You look super cute — and I just ordered the putty. they are on backorder…probably because of you! I REALLY like the Kimberly necklace, but can't spend $90. Do you know of any similar options? Thanks so much! I am going to start a blog I call "Sheaffer Told Me To" because I follow all of your advice! Just got my wedges and Toms yesterday. 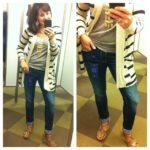 I have also re-created several of your outfits and love them all! Love your blog and I am just kidding about starting my own blog by that name – I am not a creeper! LOL But I do enjoy your enthusiasm and so far your advice has been spot on! I wonder if a blazer will make a 22 year old look too old…. Hope not because I LOVE the look. So classy with a tad bit of sassy! I love that you "overshare" when people compliment your stuff! So many times I've "hinted" at someone wanting to know where they got something, but now I just outright ask! I'm loving all your outfits with the blazer!! I love this look! So cute! I love your blog too, so glad I found you! What size did you get your blazer? I'm curious about sizing. Hi Diana! I hope you check back here for your answer! (Your blogger settings are set to "no reply" so I couldn't reply directly to you.) My blazer is a medium. Hope this helps! Awesome, thank you. I need to figure out a way to change my settings. I only ask because I ordered my normal size and felt like the arms were tight. Did you feel the same?